Potlucking by bike is tricky work, almost as tricky as picnicking. For some reason, sweets lend themselves to portability in a way roast goose just doesn't. And so the potluck diabetic begins his insulin spiral through the shoofly pies and gingersnaps and (in some anonymous midwestern towns dear to everyone's heart) triple-cookie marshmallow jello krispy mush. 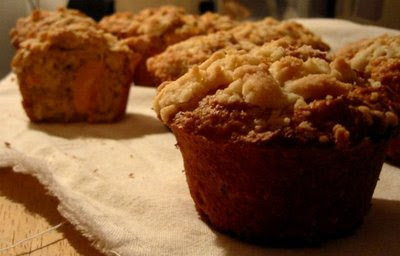 Just think of these muffins as portable peach cobbler. Pack them full of fiber, butter, and less-guilty sugars, bike really fast, and maybe you'll turn out all right in the end. I flipped open the old Boston Cooking School Cookbook for the structure here, but a little of this morning's oatmeal porridge sneaked in, the butter got itself browned, a streusel fell on top, and the peaches just got all sunny-soft inside. Preheat the oven to 400 and butter a muffin pan. Peel two big peaches and dice them in medium chunks. Chop the peels a little finer and (not kidding!) add them back to the peaches. Add the liquids to the dries, fold in the peaches, ladle into the buttered muffin holes, and sprinkle generously with streusel. Bake until golden and a knife comes out clean, some 25 minutes. Makes 1.5 dozen.